The rains in California have finally taken a momentary break so today gave me the chance to go outside and ORAT! Of course, I had to bring Leafy with me since he’s been needing some exercise in the backyard. He was not happy about the temperature, so I suppose that will have to wait until spring. Here’s the main attraction! As part of my Holiday HAWL I received a set of 1:72 Hongwell Cararama’s and I am delighted to say that they are simply amazing! Individual plastic lenses, great metallic colors, accurate and extremely detailed tampos, they’ve got it all! It amazes me that a little, largely unknown Chinese company can produce such fantastic products without being more widely recognized! Even the undersides have everything picked out in perfect, 3D detail! For comparison, here’s a TLV Nissan Terrano and I honestly cannot see anything to justify the TLV’s price ($22) over the Hongwells’ ($2.50), although I might have just been lucky and found a great deal. Sure, the Hongwell’s aren’t made of quite as high-quality materials, but everything feels solid and is rendered beautifully! Time to off-road all things! 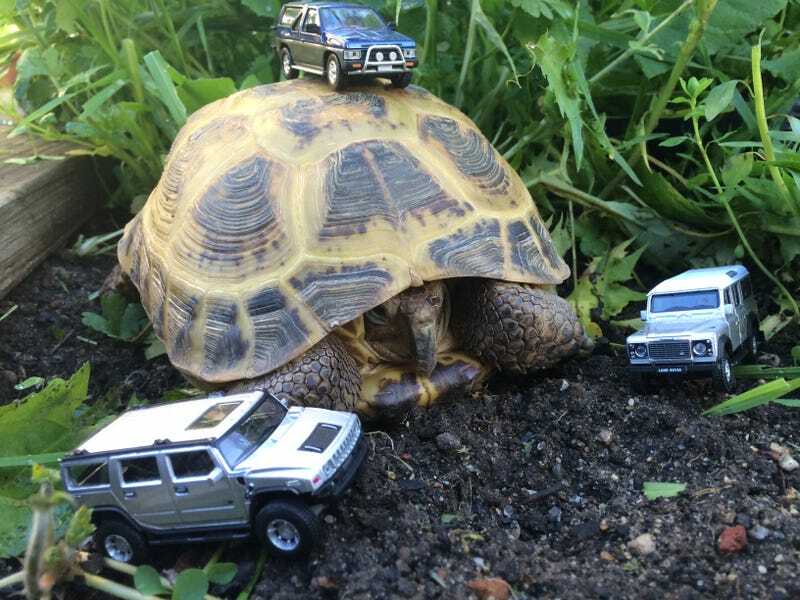 That’s enough tortoise-bothering! Back to the studio! Here’s a bit of a scale comparison if you’re not familiar with TLV’s “true 1:64" or Hongwell’s “occasionally 1:72 but really just depends on what we feel like” scales. Anyways, thanks for looking, stay tuned for more Hongwells in the future, and see you around LaLD!